Nebraska-Omaha has finally figured out who will replace Ryan Massa in net (the four-year starter logged over 4000 career minutes between the pipes for the Mavs and was a key component in their Frozen Four run a year ago). In twelve starts, freshman netminder Evan Weninger ranks second in the league in save percentage (.942) and third in goals-against average, allowing less than two goals per game. Fortunately for North Dakota, Weninger will not be in uniform this weekend due to an injury. Surprisingly, Mavericks’ head coach Dean Blais has elected to give freshman Alex Blankenburg his first career start in Friday’s opener rather than tab junior Kirk Thompson, who has performed capably in eight starts this season. Thompson has amassed a record of 4-3-1 with a 2.75 goals-against average and an .889 save percentage. Blankenburg has no official NCAA statistics (of course) and is listed at 5-8 and 162 pounds. His counterpart in the UND net, sophomore Cam Johnson, has been absolutely incredible since returning from injury in late November. Johnson has won eight consecutive games (four by shutout) and allowed a total of four goals over that stretch (one each in the other four victories). The Flint, Michigan native went nearly 300 consecutive minutes without allowing a goal (a UND record and the second-longest in the history of NCAA Division I men’s hockey) and was named both the Hockey Commissioners’ Association and NCHC Player of the Month for the month of December. Johnson’s play, equal parts steady and spectacular, has meant that North Dakota has been able to hold leads. During the 2015-16 campaign, Brad Berry’s squad is unbeaten (11-0-1) when leading after the first forty minutes of play. In fact, North Dakota has gone 62 straight games without a loss when leading after the first two periods. Amazingly, UND is 11th nationally in scoring offense 2nd in scoring defense, notching 75 goals and allowing only 35 in 22 games this season. By comparison, UNO has outscored opponents 66-47 over their first 20 games. Nationally, only Quinnipiac (87 goals for/35 goals against in 23 games) boasts a better scoring margin than North Dakota. Omaha was swept by visiting Denver last weekend, the second sweep the Mavericks have suffered this season (UNO also lost a pair of games at Western Michigan in late October). Omaha’s first period on Friday night will set the tone for the entire weekend, as head coach Dean Blais will have his squad prepared to rebound from their first two home losses of the season. Berry has his team in very good position for a 14th consecutive NCAA tournament appearance. UND went 9-1-2 in non-conference games this season, with a home split with Wisconsin accounting for the only loss in twelve games. The Fighting Hawks are currently 2nd in the Pairwise rankings, one of four NCHC teams (along with Omaha, St. Cloud State, and Denver) who would make the NCAA’s if the season ended today. Minnesota-Duluth sits squarely on the bubble at 16, with Western Michigan, Miami, and Colorado College outside the top 25. Omaha will host North Dakota in late February for UND’s first games in the newly-opened Baxter Arena (capacity 7,898). With hockey back on the UNO campus, North Dakota can expect a raucous, rowdy atmosphere next month. Brad Berry has his squad playing well on the road, going 10-1-2 in the first half of the season. No team in the country has more road wins than North Dakota. UND’s next home victory will mark 200 home wins since the current Ralph Engelstad Arena opened prior to the 2001-2002 season. North Dakota is 199-73-34 (.706) all-time at the Palace on the Prairie, including an 8-1-1 record this season. The team will be wearing green jerseys at home for the first time in the Ralph, and a Green Out is planned for Friday’s opener. Fans are encouraged to wear green to match and support the home squad. NCHC teams will wear dark jerseys at home and white jerseys on the road for the second half of the season (conference games only). Last meeting: January 31, 2015 (Omaha, NE). UND flipped the script from Friday’s opener as Brendan O’Donnell potted the game-winner two minutes into overtime to give North Dakota a 4-3 victory. One night earlier, Omaha forward Austin Ortega’s goal with 33 ticks remaining in the extra frame spoiled UND’s third period comeback. Five of the twelve goals in the series were scored on the power play. Last meeting in Grand Forks: November 29, 2014. Zane McIntyre made 32 saves as the Green and White built a 3-1 lead and held on for a 3-2 home victory. North Dakota senior forward Mark McMillan scored a second period goal that withstood a lengthy review, and senior captain Stephane Pattyn potted a shorthanded tally late in the middle frame for the game winning goal. UND and UNO skated to a 2-2 tie in Friday’s opener, but Nebraska-Omaha won the shootout for the extra league point. Most memorable meeting: The game that UND fans will long remember is the outdoor game played at TD Ameritrade Park (Omaha, Nebraska) on February 9th, 2013. One day after winning a tight 2-1 contest indoors, North Dakota throttled UNO 5-2 on a sunny, melty afternoon. Mavericks netminder John Faulkner was pulled after allowing three goals on five shots in just ten minutes of game action. All-time: UND leads the all-time series 9-6-1 (.594), including a 4-3-1 (.563) record in games played in Grand Forks. North Dakota has picked up six wins and a tie in the last ten games between the schools, outscoring the Mavs 30-27 over that stretch. Three of the last four games have gone to overtime. Dean Blais, who was the head coach at UND from 1994-2004, collected 262 victories at North Dakota and led the school to national titles in 1997 and 2000. Senior forward Drake Caggiula has appeared in 144 games in his North Dakota career, tied with Minnesota State’s Bryce Gervais for the most among all active NCAA Division I men’s hockey players. Prior to last weekend’s sweep at the hands of Denver, UNO had gone 8-1-1 in its previous ten games. Both UND and Omaha are tied for second in the nation with six shorthanded goals, one behind first-place Penn State. North Dakota has not lost since November 21st, a string of eight consecutive victories. Both games this weekend will be televised on Midco Sports Network. Saturday’s contest will also be featured on FOX College Sports Central. A high definition webcast of the games is also available to NCHC.tv subscribers. All UND men’s hockey games (home and away) can be heard on 96.1 FM and on stations across the UND Sports Network (as well as through the iHeart Radio app). Follow @UNDMHockey for real-time Twitter updates, or follow the action via live chat at UNDsports.com. Here are the key questions for this series: Which defensive pairing will Brad Berry match up against Jake Guentzel’s line (with RW Austin Ortega and whoever plays left wing), and will those blueliners be effective? How will the CBS line (Caggiula, Brock Boesser, and Nick Schmaltz) fare against a rookie netminder making his first start in a hostile environment? And how will the officials call a game that is certain to be hard-nosed, gritty, and physical? The fans are in for a treat this weekend, and both teams will leave with points. 2-2 tie (North Dakota wins the shootout), UND 4-1. A quick flashback to November 13th, 2009: UND entered the weekend series with St. Cloud State at 6-1-1, was ranked #2 in the country, and was scoring 3.62 goals per game and allowing 1.50. On the special teams side, North Dakota was scoring on 26% of their power play opportunities and had allowed only three power play goals in 41 chances (92.7%). On a very unlucky Friday the 13th for the Fighting Sioux, St. Cloud junior forward Aaron Marvin met North Dakota senior defenseman Chay Genoway with a high elbow, sending Genoway into the glass and to the ice. UND’s captain and preseason All-American has not returned to game action (post-concussion syndrome) and the Green and White have struggled in his absence. Since that game, North Dakota is 6-9-4 and is scoring 2.47 goals per contest while allowing 2.53. After converting on 13 of 50 man advantage opportunities with Genoway in the lineup, the Fighting Sioux have potted only 16 goals on 103 power plays (15.5%) in his absence. There has been much debate this week regarding whether one of Genoway’s teammates will attempt to exact retribution against Marvin for his illegal hit; it is my opinion that the best way to do that would be on the scoreboard rather than attempting to injure an opponent. For St. Cloud, the opening of the year 2010 was stellar. The Huskies won their first nine games after the calendar turned, but have just one victory in the past three games. During the current twelve game stretch (10-1-1), St. Cloud has converted better than 28 percent of their power play opportunities. After this weekend’s series, SCSU will travel to Wisconsin for a pair before playing a home and home with Minnesota State Mankato to close out the regular season. SCSU head coach Bob Motzko has been rotating netminders, playing junior Dan Dunn on Fridays and freshman Mike Lee on Saturdays. That cycle will continue in the series against the Fighting Sioux. This weekend, the teams will be earning points for the UND/SCSU Challenge Cup, a traveling fan trophy awarded to the team which wins the four-game season series. The teams split the series in Grand Forks, so the Cup is on the line this weekend and will be awarded in St. Cloud on February 13, 2010. North Dakota has won at least a share of the Challenge Cup each of the past three seasons. Last Meeting: November 14, 2009 (Grand Forks, ND). One night after defeating St. Cloud but losing Chay Genoway, the Huskies scored the first three goals of the game and downed the Fighting Sioux 3-2 to earn a split of the weekend series. Last Meeting in St. Cloud: January 31, 2009. North Dakota rebounds to defeat St. Cloud State 4-2 after suffering their first shutout loss of the season in Friday’s opener (3-0). Senior captain Ryan Duncan scored the game-winner for the Fighting Sioux. Most Important Meeting: March 17, 2001 (St. Paul, MN). St. Cloud State defeated North Dakota 6-5 to claim the 2001 WCHA Final Five Championship. Derek Eastman scored the game-winner in overtime after UND scored three goals in the final ten minutes of regulation to force the extra session. All-time Series: UND leads the all-time series, 51-28-10 (.629), and holds a record of 20-15-5 (.563) in games played in St. Cloud. St, Cloud has not won a game this season when trailing after one period of play (0-3-3), but the Huskies are doubling up opponents (38 goals scored, 19 allowed) in the opening frame. UND sophomore goaltender Brad Eidsness is 4-1 in his career against St. Cloud. SCSU head coach Bob Motzko will be looking to pick up his 100th win this weekend. Under the new 12-team schedule rotation beginning next season, the Fighting Sioux and Huskies will continue to play four regular season games each year. The last two times North Dakota has traveled to St. Cloud, the Fighting Sioux have lost on Friday and won on Saturday. I think UND will reverse the trend this weekend with a strong first period on Friday night. In Saturday’s rematch, tempers will flare and the Huskies power play will be the difference. UND 3-2, SCSU 4-1. If this prediction holds, North Dakota and St. Cloud State will share the Challenge Cup for the first time since the 2007-08 season. I look forward to this series every year because of the unique relationship we have with the Center Ice Club, the official hockey booster organization for the St. Cloud State University Huskies. On behalf of the Center Ice Club, I would like to invite you to the UND/SCSU pre-game social on Saturday afternoon from 4:00 to 6:00 p.m. at Legends Grill and Bar in the Holiday Inn Hotel and Suites in St. Cloud. This is a great opportunity to meet fans on both sides of the rivalry, share in some complimentary food and door prizes, and view the Challenge Cup. This event is free and open to all fans 21 and older. While Internet forums are sometimes (rightfully) thought of as untamed jungles into which only the thickest of skin dare tread, they also foster a strong community among distant strangers brought together by a common tie. Over the past week, the SiouxSports.com community rallied behind a 14 year-old Sioux fan in the Twin Cities who was recently diagnosed with leukemia. In addition to visiting his Caring Bridge site to drop notes of well wishes, fans proposed chipping in to buy his family an over-the-air satellite dish so he could watch all the Sioux games for free while recovering. Enough Sioux fans, none of whom knew each other or Nick, offered to chip in that the plan was surely becoming a reality. 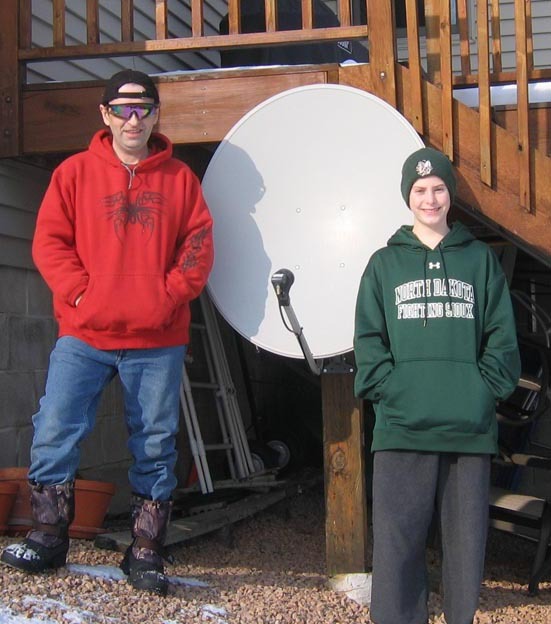 When a Sioux fan contacted a satellite dish installer who frequents the forum (and who has installed dishes for countless other forum denizens) to arrange the details, “PSB” was happy not only to perform the installation, but to donate the entire system himself. Still no Sioux sports to talk about, so another installment of “A day in the life of running a college athletics website”. Readers may remember the controversy last summer when the NCAA threw a newspaper reporter out of the College World Series for blogging from the press box. The NCAA has finally clarified its position on blogging as part of its new Conditions on Media Credentials. Note that score/time updates do count as blog entries. Owning a college sports web site doesn’t usually bring with it much intrigue or drama, though having a blog does allow me to share interesting stories about the online college hockey world with you when they do occur. The wording used to describe the services needs clarification because it is unacceptable as indefinite. Applicant may adopt the following identification of services, if accurate: Providing information in the field of rankings of college hockey teams; and publication of books featuring rankings of college hockey teams. Though there seemed to be some confusion between the two parties about wording (is USCHO a book or a web site? is PAIRWISE a marketing slogan or the name of a database? ), it seemed like USCHO just needed to adopt the suggested description. I start getting ready to scrub the word “pairwise” from SiouxSports.com and come up with the SiouxSports.com Power (PWR) rankings (which is what everyone thinks PWR stands for, anyway). USCHO seems pleased with the change in wording, though did want to note that they publish a website, not books. Page 9 — Wiktionary?!? Seriously, will someone buy the PTO a subscription to the OED? I think m-w.com is free. Page 10 — Mathworld, that sounds like an amusement park where I could imagine running into Whelan. Page 12-16 — SiouxSports.com. w00t. I’m particularly impressed that he grabbed our awesome individual team detailed pairwise comparisons table, which I still think is the best on the net. Even if the word “Pairwise” has become descriptive of a general process by which items are ordered and ranked by comparing each item to another, the fact that such a process is employed in a specific sport application in which the source of the ranking chooses and assigns weights to selected criteria makes it clear that the word is, at best, suggestive of what makes PAIRWISE rankings better than its competition. Ok, I think I’m getting it. USCHO is trying to lay claim to PAIRWISE in all caps, differentiated from pairwise, the descriptive term. Huh. The success of our PAIRWISE rankings help establish uscho.com as a definitive source of information about college hockey and consequently increases the traffic to our site. Obviously it is economically benefical to us to have high traffic rankings. Is USCHO’s new desire to trademark PAIRWISE because CollegeHockeyNews is gaining ground as a source of that information? It hardly seems a coincidence that this occurred so soon after the CHN guys split off. The examining attorney has also considered the applicant’s arguments carefully but has found them unpersuasive. The term “PAIRWISE” as used in the mark merely indicates that the pairwise method was used to generate the college hockey team rankings. Page 4-6: Is PTO really using a page from USCHO’s site to try to demonstrate that Pairwise is a generic description. I don’t get this one. I think those last three sets of evidence are flawed, for reasons I’ll describe in the next section. What does Jim make of all of this? Keep in mind that USCHO wasn’t trying to protect the mathematical formula behind PWR (which by my understanding could have proven difficult), but rather the name “PAIRWISE” when used to describe their rankings using that formula. Though the formula isn’t their invention, but rather mimics the NCAA Selection Criteria, trademarking their own unique name of their presentation of those rankings strikes me as plausible. Searching the HOCKEY-L archives** may give you fascinating look at the origin of all of this stuff; the first reference I could find to the criteria came from Keith Instone, but the first reference I could find to PAIRWISE or PWR was from Tim Brule (of USCHO). As to the numerous examples from the Internet of sites using PWR/Pairwise to describe the college hockey rankings, though there was no way for the examiner to know it, the term is likely in use in all of those places specifically because USCHO popularized it. I have no idea if allowing it become part of the college hockey lexicon for 10 years before attempting to trademark it harmed their case, but I can say on behalf of SiouxSports.com that our PWR rankings are called PWR specifically so people are aware that they use the same methodology as those USCHO calls PAIRWISE (PWR’s very purpose on SiouxSports.com is to assist people who want to analyze and predict the PAIRWISE rankings by providing detail of the calculations beyond that available from USCHO). However, that is all likely irrelevant, as the nail in the coffin of USCHO’s claim seemed to be that pairwise is a generic term descriptive of the ranking methodology. Though the first reference I can find to that name did come from Tim Brule on HOCKEY-L, it also predated the creation of USCHO, so it’s not surprising that the rankings were given a descriptive name rather than one chosen with attention to trademark suitability. If only he had chosen Tim’s Rankings for American College Hockey (TRACH). Final thought — it’s almost impossible to run sites like these without a good IP attorney. Thanks to John (ours). ** While browsing the HOCKEY-L archives, you may stumble upon the Nov 29, 1995, announcement of SiouxSports.com, which wasn’t yet called SiouxSports.com, but is a pleasant reminder of our longevity. Author Jim DahlPosted on December 13, 2007 December 13, 2007 Categories Men's Hockey, SiouxSports.com9 Comments on Does anyone own PAIRWISE? Welcome to the SiouxSports.com blog. While the world undoubtedly does not need a new blog, I view this as a repackaging of the information you already come to SiouxSports.com to find. It will complement the news listings and message boards by providing much of the same information, but in a different format that may be more accessible and useful to certain audiences. Like the news listings, we will use it to point out interesting information on the Sioux discovered from media across the Internet and offline. However, like the message board, it will allow us to include some commentary, analysis, and personal experiences with that news. Because a limited group of bloggers can originate new articles, quality will be high and readers can catch up on the latest news even when they don’t have time to engage in the message boards. Categorization of posts will allow you to quickly locate just those posts that reference a topic in which you’re interested. Finally, this increases your opportunity to participate. All registered SiouxSports.com members can post comments on any blog entry. No new accounts or passwords are required, yet the lack of anonymity should keep spam and trolling to a minimum (as SiouxSports.com members have come to expect).